Welcome to the Ages and Stages® website for parents and professionals. As a speech-language pathologist, feeding therapist, published author, international speaker, university instructor, and mother, I have over 30 years of experience working with children, their families, their therapists, and their doctors. 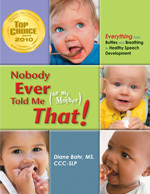 Over the years, I have witnessed countless numbers of parents and professionals struggling to find specific, up-to-date, evidence-based, and easy-to-apply techniques that systematically encourage the best possible feeding, speech, and mouth development in children. With information scattered over the Internet and throughout the literature, parents and professionals often don't know which specific skills to expect or encourage. I would like to help you navigate this "sea of information." This much-needed book helps parents identify possible feeding and speech problems early and provides a wealth of practical advice and strategies from infancy up, to help secure the best possible prognosis for the child's future development. It's a treasure for anyone that cares for children. So, let's join together to create a generation of healthier and happier children (and parents).